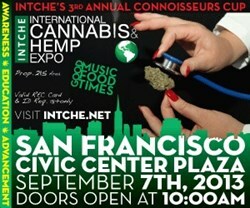 The International Cannabis and Hemp Expo (INTCHE) is hosting its 3rd Annual Connoisseurs Cup at the Civic Center Plaza in San Francisco on Saturday, September 7, 2013. We’re excited to be a part of INTCHE’s overall mission and for this opportunity to reach out to all patients who are looking for answers about alternative medicine. 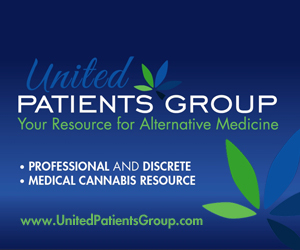 Medical marijuana patient resource United Patients Group joins industry leaders, collectives, patients and advocates this Saturday, September 7, 2013, for the International Cannabis and Hemp Expo’s (INTCHE) 3rd Annual Connoisseurs Cup in San Francisco. VIP ticket holders will judge various cannabis strains, edibles and concentrates from contributors to determine who will win the Connoisseurs Cup, a top honor in the medical marijuana industry and one that promotes INTCHE’s mission of education, awareness and advancement of medicinal cannabis and hemp. “We’re excited to be a part of INTCHE’s overall mission and for this opportunity to reach out to all patients who are looking for answers about alternative medicine,” said John Malanca, founder and owner of UnitedPatientsGroup.com. The event – the first of its kind in San Francisco – will be held from 10 am to 9 pm at the Civic Center Plaza. INTCHE expects to have over 10,000 patients and non-patients attending the event throughout the day. INTCHE will have a 215 section, where the collectives will be located and approved for safe access distribution of medicine for patients with a valid recommendation card. In addition, there will be a non-215 section, for those with and without cards, featuring a diverse group of vendors and attractions such as glass blowing, fire-dancers, live music and plenty of food. “There will also be keynote speakers with credible backgrounds giving insight to current medicinal cannabis laws and presenting personal stories regarding medicinal cannabis as a beneficial alternative to modern medicine,” said Melinda Neal of INTCHE. To be a judge, patients with a valid recommendation card can purchase a VIP ticket and pick up a Judge’s Box at an authorized collective prior to the event. The contents of the box must be tested before the event as its contents cannot be brought into the Connoisseurs Cup. Ballots must be submitted to the INTCHE resource center on the day of the event prior to entrance. For more information about INTCHE’s 3rd Annual Connoisseurs Cup, visit http://www.INTCHE.net or to purchase tickets directly, go to http://intchesf-eorg.eventbrite.com/. For more information about United Patients Group, visit http://www.UnitedPatientsGroup.com or call (415) 524-8099. The best way to stay informed about developments is to "like" United Patients Group on Facebook and "follow" Untied Patients Group on Twitter.